Did you know that plain old kitchen cinnamon is an amazing fungicide? Not only that, but cinnamon can be used in the garden so many different ways. I've discovered 8 different ways to use cinnamon for plants. From fungus killer to rooting hormone, cinnamon has got ya covered! There are 2 things that I'm sure you know about me by now. 2) I prefer to do things as natural as possible. Pretty simple right? I try to do things the way my great-grandma did. She lived on a farm in the 1920's, and raised 6 kids on 1 income! Everything did double duty and it was done the cheapest way possible. I'm just like her! So I'm often looking for simple solutions instead of the expensive commercial crap the media tries to convince us we need now. That type of search is exactly what led me to cinnamon as a remedy for what ails my plants. 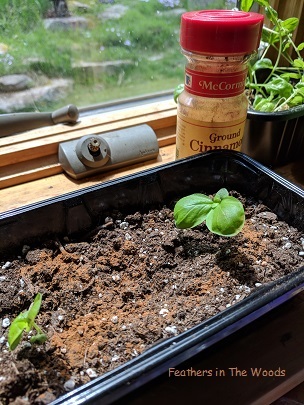 I mostly use cinnamon for seedlings since cinnamon prevents dampening off disease, but it can be used several other ways. Here are my most common uses for cinnamon in the home & garden. Nothing worse then having to waste a beautiful day pulling mushrooms from the mulch in my flower beds. Mushrooms are fungus and since cinnamon has antifungal properties, by dusting cinnamon all over the garden mulch, it helps to control mushroom growth. 3) Cinnamon as rooting hormone. Cinnamon is much cheaper than the chemical rooting hormone they sell in the big box store and just as effective! Just apply cinnamon powder to the stem before you plant the cutting. 4) Cinnamon as ant deterrent. Ants do not like cinnamon! Sprinkle cinnamon in your greenhouse or around your garden beds to deter garden pests. It will not kill the ants, but they will stay away from it. Sprinkle it by your doors if ants are coming into your house. They really hate to cross a line of cinnamon! 5) Cinnamon heals plant wounds. Overzealous pruning or a slip of the weed whacker and you'll have a plant with a wound that needs fixed up. Simply dust cinnamon on the wound to encourage healing and prevent fungal infection at the same time. Dust cinnamon along the outside of the garden to deter rabbits, squirrels and even moles. Small critters are close enough to the ground that as they walk through the cinnamon they will get it on their face and breathe it in. Cinnamon will irritate the mucus membranes of their nose and mouth without causing permanent harm, but will deter them from visiting again. 8) Cinnamon for house plants. Cinnamon gets rid of molds and mildew in house plants too. Simply sprinkle a bit of cinnamon on the soil. It will also get rid of gnats if you happen to have them buzzing around your house plants. These are the same gnats seedlings get. The cinnamon destroys the fungus they feed on and the gnats will die. Cinnamon also has some amazing health benefits for us so it's great to have on hand and best of all, I always find it at the dollar store! Check out these 13 Proven health benefits of cinnamon! from Dr Axe and these 9 Things you didn't know cinnamon could do from Readers Digest. If your dollar store doesn't carry it or you just use a whole lot, you can get the 'restaurant sized' jar of it here for under $5. (cheapest I've found it online) At that price and with these uses, what's not to love about cinnamon? Oh, and don't worry about buying 'true' cinnamon, it makes no difference at all for these uses. Either one will work just fine. Want more frugal gardening tips? Click here to check out my other posts on saving money in the garden. Wow! So many uses! Thanks for sharing- I have a few places in the garden that needs a dash of cinnamon! Added bonus- your garden will smell even more amazing! You're right! This is especially true for seed starting trays....they now smell great when in the house! Thanks for stopping by! I'm always looking to do stuff as naturally as possible. I'm heading over to check out your blog! Coolio...love the natural way with my veggies too :) thanks for sharing. I try to use as few chemicals as possible too! I had no idea cinnamon was a good remedy for the garden. Thanks for sharing this info with SYC. Had no idea it did all that! I'm gonna try it for rooting cuttings, since I've been doing a lot of that lately. Thanks for sharing on The Maple Hill Hop! Give it a try, it's much cheaper then rooting hormone! Oh wow...thank you so very much! I've been researching bees lately, really want to get started. Thanks for the tip! We've had problems with damping off before. This is so good to know. Thanks for sharing this at the HomeAcre Hop! It really works! I had that problem too, and was super surprised that something so simple worked so well. I knew of a couple of those, but most were new to me. Very exciting. I am also a frugal lady. Thank you for sharing on Green Thumb Thursday. I hope you swing by today with some more great stuff. Awesome! I had no idea, but now I will use cinnamon a little more often! Thanks for the tips! I love cinnamon and knew it was healthful for humans. I guess why not plants! Thanks for this amazing post. Please stop by our #theWeekendSocial next Thursday at 9:00 PM EST. I'm off to pin your link! Thanks for the invite! I'll stop by your hop tomorrow and link up! Thanks so much for sharing on the Country Fair Blog Party. I will be headed to buy cinnamon next time I am at the dollar store. As wet as we are I am sure I am about to have a fungus infestation in the garden. I also like to buy mine at the dollar store. The containers are huge! I'm glad you liked the post! Thanks for the Google+! I'm sold. I'm going to buy a big bottle of cinnamon next time I'm at the store. I pick it up at the dollar store. Much cheaper there! Fantastic! We blog our garden adventures at wildwestgardeners.blogspot.com, and this is just what our Wild West garden is going to get dusted with this year! Thanks for the tips! Does it work to deter squash beetles? I will head over and check out your blog! I don't know about squash beetles since we don't get many of them. Give it a try though...it can't hurt! This is amazing - I hate those gnats on my seedlings, I'm going to go sprinkle cinnamon on them right away! Thanks so much for sharing at the Tuesday Garden Party. Those gnats are the worst, aren't they? Where do they come from? They just appear in the house sometimes! ugh! Give it a try, it's worked for me! Much cheaper then rooting hormone, that's for sure! Let me know how it works for you! Caution cat owners! Cats love cinnamon and may roll around in it similar to the catnip & they could destroy your plants! Hmmmm, my cat doesn't pay attention to my plants so I haven't noticed a problem. Thanks for the tip! My houseplants started to get a fungus on the soil and I sprinkled cinnamon and it made it worse! Had to repot every one of them that had it. Maybe this works if you put it on before there is mold, but definitely not after it has started! Maybe it depends on the type of fungus? I know when my seedlings get that green tinged mold this clears it right up. I hope your plants are ok! I have a few outdoor plants that have some sort of ick...was wondering if I would sprinkle the plant with the cinnamon. Have you tried anything like that before?? It depends what type of ick. If it's fungal it should help! If it doesn't shoot me a message with some details and maybe we can figure it out! Great post! Do you think I could spray a cinnamon water mix on Camilias to get rid of black soot/honeydew/aphids? Thanks. Have you tried a jet of water from the garden hose? That usually knocks the aphids off and cleans the plant off a bit. Without the aphids the honeydew/black soot shouldn't come back. Hope that helps! Not good for edible plants! I like this. I always have lots of cinnamon, but do I put it on the soil on my house plants every time I water them? Amazing! I can't wait to try some of these ideas. Hi! Do you know if cinnamon works to kill or keep away the aphids from my herbs, mainly basil and celery? I tried whit garlic and also chilli! But doesn't works!!! i did not know cinnamon can do all this. i love the post. i want to try the cinnamon as a rooting hormone.I have a piece of a plant that broke off. i have had the end of the plant in a cup of water for a while now.but it doesnt seem to be growing any roots.the plant is doing good in the cupof water, but like i said wont grow roots. if i rub cinnamon on the end as a root hormone. do i place it back in the cupof water? what do i with it after the cinnamon? 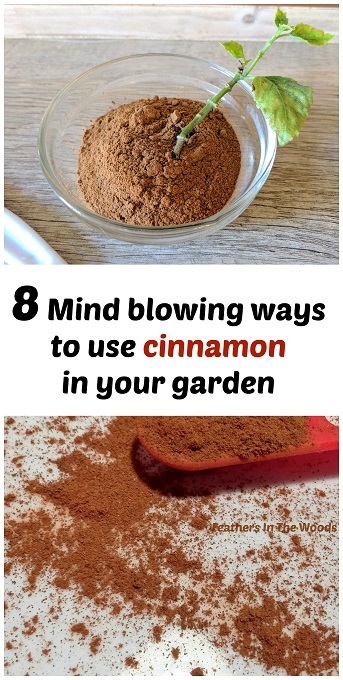 I be never heard of using cinnamon in my garden l do appreciate the tip and will get back to you after I try it out. Thanks Lisa. Lisa do you think this might help with a white fly problem I have out here in Northern CA???? I don't know, but it's worth a try! Let me know if it works! 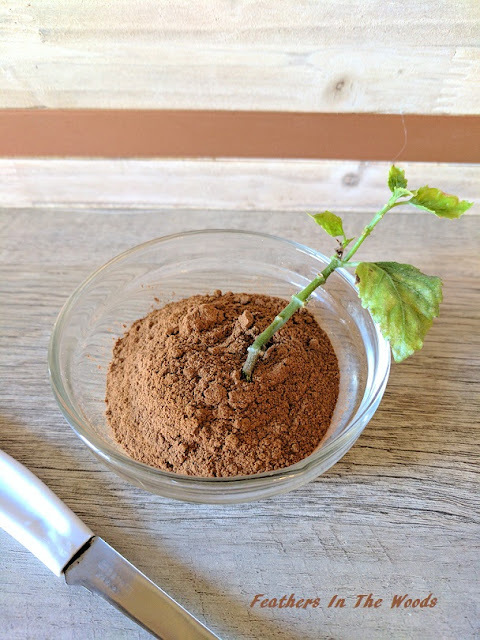 Hi, I used cinnamon tea instead or powder cinnamon, will the tea hurt my moringa plants? I have green algae on my potted moringa, also yellow leaves, I read on a website to use Epsom salt? Cinnamon tea won't work the same way. Better to just pick up some cinnamon from the dollar store or grocery! I don't think epsom salts will help.